Raised in the Seattle area, I have been a professional musician since my teens. I have directed award-winning High School Bands, musicals and community orchestras. My expertise in percussion and keyboard have allowed me to perform throughout the United States with orchestras, jazz and rock ensembles. I am also a high school principal. Here are 9 valuable lessons I’ve learned along the way. 1. Great conductors turn their back against the audience to conduct the orchestra. No matter what challenge is at hand (or audience response), they focus on doing the right thing with their team. 2. Great conductors spend hours and hours reviewing the musical score and “vision” of the end result. Now, I spend an inordinate amount of time reviewing our school’s vision. 3. Great conductors practice. Practice definitely makes perfect. I review and practice my leadership skills weekly. I just don’t assume the “music” of a great working team will happen by itself. 4. Great Conductors get the best out of their team. They ensure that individual musicians, and the “team”, feel significant and valued. I do my best to take the time for relationship building. 5. Great Conductors are aware of their gestures and the impact they have on the ensemble. Everything’s done with “intention“. They are role models. 6. Great conductors always share the spotlight. Without the orchestra, the conductor is nothing. Together Everyone Achieves More. 7. The conductor stands on a podium and is visible to every member of his orchestra. Visibility is key when leading an effective organization. 8. Great conductors strive for balance with the orchestra. One section should not “overplay” other sections unless directed. The conductor pays attention to every section of the orchestra, or organization, to help them perform effectively within the entire orchestra. 9. Great Conductors lead! They inspire, and create an exciting environment, and share a clear vision for the orchestra. 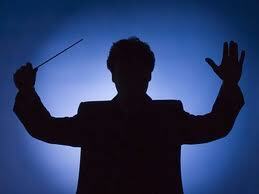 Are you a great conductor for your organization? 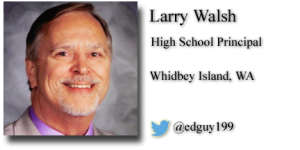 Larry Walsh is a High School Principal in beautiful Whidbey Island, WA. Forward thinking, 21st century educator. 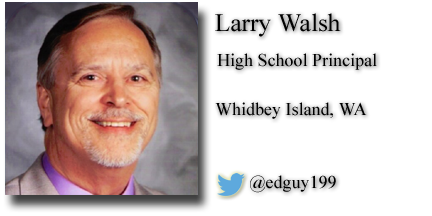 He shares his insights on his website, Larry Walsh, High School Principal. Follow Larry on Twitter at @edguy199.